Virtualization was already making headway in the 90s, it’s impossible to imagine the IT world of today without it. The key benefits include better use of resources, lower investment costs and platform independency. This article shows how Wibu-Systems solutions successfully handle these topics in virtual space as well. 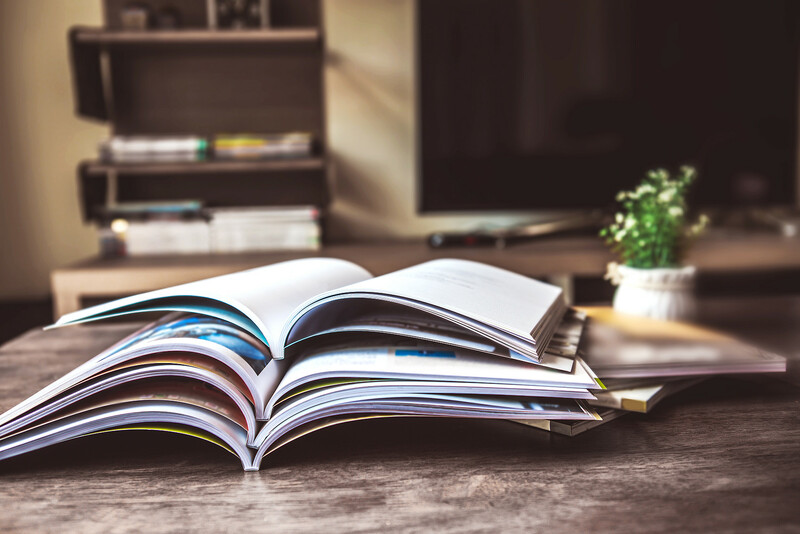 CodeMeter software protection and licensing solutions from Wibu-Systems provide software vendors with the tools they need to protect their intended license models from violation in a virtual environment. CodeMeter supports the use of both hardware (CmDongle/CmCard) and software based protection solutions (CmActLicense) in the virtual environment. The general aim is to make sure licenses are only visible where they are allowed to be used. Unfortunately there is a serious discrepancy here between the hardware and software solution: Whereas a CmDongle contains and protects an actual license, the software equivalent is directly stored on a system and is copied whenever a virtual system is created or cloned. The only way to prevent this is to devise some way to tie a software license to a virtual machine. And this is exactly what Wibu-Systems has done with SmartBind®. This system, which benefits from many years of experience and for which a patent has been filed, ties a software license to hardware. It not only binds the software license to various hardware features of a computer but also to features particularly relevant to virtual environments. The probability now of successfully recognizing a clone increases to 98 per cent. A license which has been copied or moved as a result of cloning can now be safely invalidated. 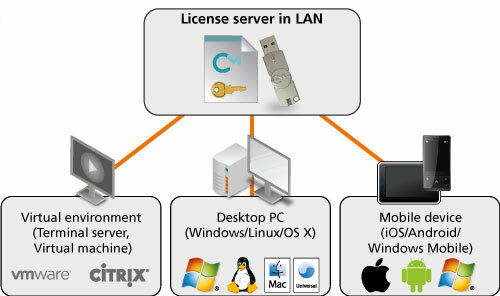 A virtual machine implemented as a network license server offers major benefits in terms of efficiency and utilization by allocating and monitoring the available licenses in the network. A license server can also be used in heterogeneous networks containing real machines with diverse operating systems, and virtual environments and terminal servers. Generally speaking, it doesn’t matter whether the available licenses are stored in a CmDongle plugged into the hardware or in a CmActLicense tied to the license server, although a CmDongle offers the benefit of greater mobility. It can be moved from one server to another, making the licenses available there instead. Licenses can be made available in a virtual environment using various kinds of techniques. For example, if a CmDongle with local licenses is allocated to a specific guest of a host system, the licenses are only visible to this guest. On the other hand, network licenses stored on a host system can be accessed by the host and all the guests installed on that host. A prerequisite for using licenses on either system is the installation of the CodeMeter service on both the host and guest system. This ensures secure communication between the individual components and correct calculation of the number of licenses in use. Flexible technology means different virtual systems can be connected together. Network licenses allocated to the host system via a dongle can be made available to other host and guest systems located in the same network. Allocation of local licenses on the other hand is restricted to the respective local system. 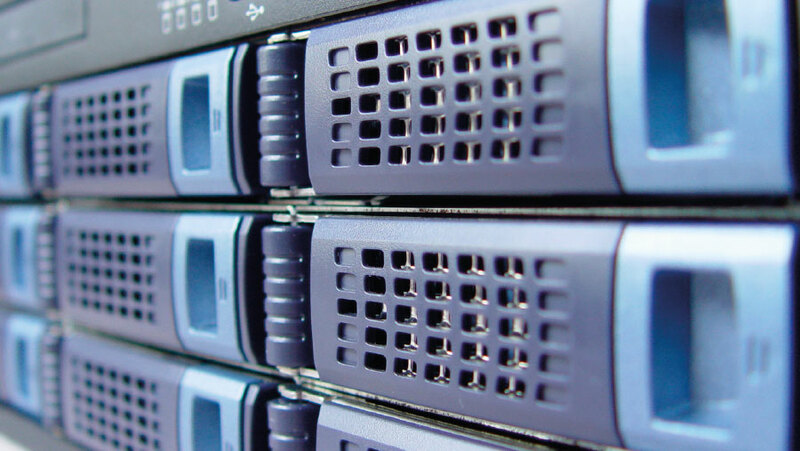 A terminal server allows a large number of users to share a host computer including its resources and programs. Efficient resource utilization is very important as the host system’s hardware is simultaneously accessed by many users. When subsequentely logging on to the terminal server, the user’s computer only functions as an output/input terminal. Users are assigned their own working environment (session) which protects them from other terminal server users. The CodeMeter service from Wibu-Systems ensures the available licenses on the terminal server are correctly allocated and verified for each session. Dongle servers are another way of allocating licenses in a network. Hardware dongles cannot be used in certain situations such as cloud solutions because they cannot be physically plugged into a computer. The question then arises, why not use a dongle over the network? Security can be guaranteed by encrypting the communication and exclusively assigning the dongle to a single user. 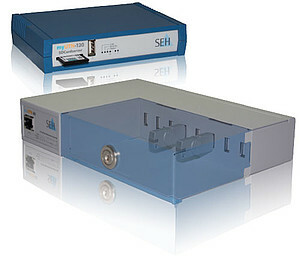 The myUTN-80 USB dongle server and myUTN-120 SD card server from SEH-Computertechnik GmbH in Bielefeld, Germany, allow you to use your software normally without having to plug the copy protection hardware dongle into your local PC. Up to eight dongles or one SD card with full functionality are securely and centrally available. As with a locally connected device, the dongle can only be used by one user at a time via a point-to-point connection. It is guaranteed that the software vendor’s license terms are not violated at any time. Do you always know where your dongle is? Is it lying around unused or is a colleague using it? Storing dongles in a single central location puts an end to these questions once and for all! Do you want to allocate network licenses to specific users or grant them exclusive access privileges? This is quick and easy to set up with a dongle server! The server exclusively assigns dongles to specific users with the corresponding encryption of the interfaces. Have you ever you lost or mislaid your dongle, or was it even stolen? The dongle server’s lockable box securely protects the dongles inside. No USB port on your computer? All USB ports used? Or are you using a virtual computer? If the answer to any of these questions is yes, a dongle server is the alternative solution for your applications.